Whether you are looking to bring your photos out of digital storage or make a memory album brimming with your life's most cherished moments, you can be sure that our custom photo book will satisfy your needs. We offer several book sizes, cover styles and background templates that will make your photos stand out. Choose from a wide variety of photo layouts and add your own text to showcase your most irreplaceable memories for all to enjoy. Our custom photo books make a great addition to your current album collection and are the ultimate gift for sharing your favorite memories with your loved ones. First, gather your photos. Collect your digital images stored on your smart phone or computer. You can even scan your old photographs using a photo scanner or photo scanning phone app to incorporate your older memories. Then, upload your photos from your computer to your Mailpix account's photo folder. After uploading your photos, select your custom album size and cover style. After your book opens in the photo book maker, begin creating each layout, page by page. Choose from our many layouts or create your own to display your best memories in style. Once you've created your photo layouts, you can choose a different background template for each page and add your own text for a fully personalized look. Finally, review your book, place it in the cart and enter your billing and shipping information. Then, place your order! Our personalized picture albums come in a variety of sizes and cover options that are perfect for any photo book occasion. Select a photo book that compliments the type of album you are making, whether it's a wedding picture book or an everyday photo album. Each book style is easy to customize and can be tailored to fit your memories to a "T". Simply upload your photos to your Mailpix account and select the book that's right for you. Maybe you want to add interest to your album's cover using a favorite photo and a catchy title. Look no further than our photo cover albums. Select between our 8.5x11 and 8x8 photo cover book sizes and customize both the front and back for an album that displays well on a shelf or your living room coffee table. Our 8.5x11 photo cover book is also available in a lay-flat option which allows you to show off each page of memories with ease. Add a full photo that covers both the front and back or choose from a variety of photo cover layouts for an album that is beautiful both inside and out. Perhaps, you want a larger or more formal album to show off your pictures. Our large photo books are perfect for showcasing your wedding pictures, vacation photos or simply a mix of your precious memories. Whatever the occasion, our custom photo album covers are guaranteed to please. Personalize each page with your best pictures and custom text to create an album that transports you to times past. Save your memories from being hidden away in digital storage and celebrate them in style with our wide selection of custom photo books. Perhaps you are searching for a unique and heartwarming gift for a special someone. Maybe your sister has an upcoming birthday or you need a holiday gift for your best friend. Instead of hunting around endlessly at the mall, take a look at our custom photo book options and create a gift that is tailored to your friend or relative's favorite memories. With so many available options, you can make a photo book that is sure to make the perfect gift. For even more exciting gift ideas, our photo gifts page has a large selection of customizable products including home decor, drink ware, toys and more! For your sister's birthday, collect your favorite family photos from your digital library and even scan your old photographs for an everyday photo album that she will simply adore. Choose our window cover book and add a photo to the first page of yourself with your sister that will show through on the cover's cut-out window. Additionally, we offer several linen and leather cover colors that are sure to match her personal style. Decorate each page with photos from your past and make your sister smile with a photo book that brings her most precious memories to life. If you are searching for a holiday gift for your best friend, check out our custom photo cover book. Design it to her liking with her favorite photos of your best times together. Use our text feature to add your own personal messages and captions next to each photo. Our custom photo cover is perfect for any occasion. Add your favorite picture of yourself with your best friend to the front cover for a picture book that is both heartwarming and unique. Whether you are looking to commemorate a wedding, new baby, vacation or the holiday season, our customized photo albums come in variety of options that are perfect for any photo book occasion. Gather your photos and design your own picture book that brings your most treasured moments to life. After selecting the perfect size, you can peruse our large collection of background templates that are tailored for a wide variety of holidays and celebrations. Using our convenient project builder, you can choose from several photo layouts or simply create your own to artistically display your pictures to your liking. 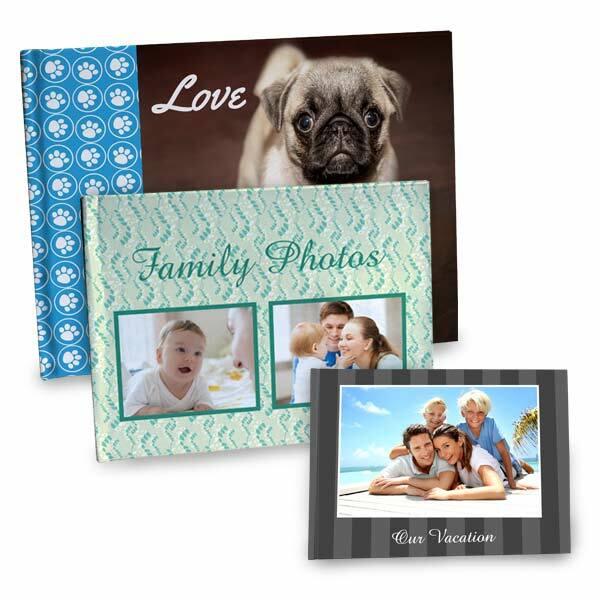 In case you don't have a particular theme for your album, Mailpix has numerous solid color and patterned backgrounds that are great for an everyday photo album that showcases all your memories from years past. Whether you are looking to bring your memories out of storage or simply a unique gift, we have unlimited options that are guaranteed to make your album a hit with both friends and family alike.